Currently Nikki, Peggy Sue and I are in weymouth for a week on the water. Normally you would say 3 is a crowd but the 3 of us seem to get along famously. Though peggy sue decided to remind us that she’s boss by throwing me into the water today, needless to say I was subsequently very nice to her. The weather has been absolutely great for training, so Nikki and I are slowly ticking off the list of areas we wanted to work on following our first trip to Europe. Things are marching on relentlessly and I am really proud of the progress we have made. We leave for Holland Regatta next week so stand by for another instalment of bad grammar and bad jokes. We have been back in the UK for just over a week now, and despite the questionable weather Nikki and I have been busy as ever. My parents had gone off to Carnac Eurocrat regatta, so along side manning the fort at home, it was a chance for us to have the work shop to our selves and make some further technical changes to the boat. Development is a continuation of iterations and following our time in both Palma and Hyeres we are now getting to grips with an optimum set up. Rest assured there was plenty of gelcoat on fingers, but fortunately due to all of the great facilities at home the mess was kept to a minimal. During the hours needed for gelcoat curing, I was able to use the blustery windy conditions to get out for a bit of kite surfing! it was great to be able to spend some time on the water, and its fair to say it has warmed up somewhat since i last indulged back at the beginning of march. I cant wait for a bit of UK summer already! Nikki and I are now back up in weymouth, we are here training for the next couple of weeks before we leave for Delta Lloyd regatta in holland. I am currently looking at the GoPro charging so stand by for some videos/pictures of our time on the water. Tomorrow the Hyeres world cup begins. When I left you last time, i was about to go and glue my fingers together with epoxy and get gelcoat all over my shorts. Well you will be pleased to know that alongside both of those thing I also managed to land a bit of the mess on the boat, and after an incredibly messy couple of days we were ready to sail. Since then we have been working really hard on the water. The weather hasn't completely been playing ball, and we actually missed one day because it was so windy. Outside of that we have sailed everyday teaming up with a number of people to work on both speed and racing. This is the final day before racing now, and like we always do, today will be filled with a final short sail, polishing and tramp tightening. We are both really excited to get out racing again, and currently the forecast looks like it could be a lightish one. But i must remember this is nacra sailing, its always windy so the likely hood is we will be flying around the bay come race day! Nikki and I have just checked into our very quaint… to put it poshly 'static home', though in real words ‘caravan', the walls are particularly thin and there seems to be an outlandishly loud frog (just confirming i am referring to an actual frog) ribbiting away outside. I do hope he gets the picture soon and settles down for the night! Hello and welcome to France. After an incredibly enjoyable week at home in cornwall, we are back to it. During my time at home I didn’t seem to waste second, days were filled with helping on the farm and getting enough jobs done so that Paddy and I could compete in every sport that ever existed. Honestly i think it might be easier to list the sports we didn’t do last week that the ones we did. The stunning cornish weather was just the place to be for farm work and activities. Paddle Boarding, one of many, many sports. But as I said we are now back in the south of France, Hyeres to be specific. Hayers this year is the first of the european World Cup regattas, this is an invite only event, so only the top level sailors will be here. Its going to be a very tightly fought week. The first of the steely tasks was for us to find our ‘static home’ in the maze of other static homes. In an attempt for the campsite to be as european as possible they add to the task by not allowing you to drive anywhere near where you need to get. instead they provide you with an airport style trolly and make you push your 100s of bags over an all terrain rally course losing items as you go. It was a challenge we relished and frankly following that, the regatta should be a breeze. Over the next few days Nikki and I have a bit of boat tinkering to do, by that i mean no doubt ending up with filler and gelcoat all over my hands. We plan to get some good hours on the water before racing starts next Wednesday. Team support arrives on Thursday to start the coaching process so we are looking forward to building on the lesson learned in Palma and taking another step forward. stand by for photos of me epoxying my fingers together! Wow what a week, Im shattered so I can only imagine how Nikki is feeling. For a week where we had a steady 8 knot forecast everyday, it was surprisingly windy and and unstable. With out a full blow by blow account of the week here are a few stand out moments for us. On day one it was windy, really windy. Apparently there was 41kts recorded by one coach. It was a day for the catamaran thoroughbred's. Nikki and I were on fire, coming into the finish line of the second race Im pretty sure we were one of the only boats still twin wiring and it was fast! One of the focuses for us this week was starting. Its fair to say we made a good steps forward in that department, we had some blinders! We moved up and down the start over the regatta in order to test ourselves in the optimum spot, and by the end we were pretty comfortable anywhere on the the line. In a fleet with so many great sailor it really does feel good to be rafting around at the front with them. We still have a long way to go, but for Nikki and I as a new team everything through until our worlds is training. Off the back of this trip to Palma, there is no doubt that we have a lot of potential, so it make sense to take our time and do things well and properly. As much as we tell our selves its a training regatta, inevitably it hard to not pay any attention to the results. But Nikki and I can leave Palma with our heads held high. We solidly qualified for the gold fleet and worked our socks off to finish in the top 20. A great start for a team that is sure to improve as the year goes on. Nikki and I now drive from here to the next venue, Hyeres in the south of France, and then fly home for a little time in the UK. The next regatta is in a couple of weeks and we are already looking forward to getting back out there. Nikki and I are back out in Palma now, having had a short stint in the Uk for some necessary errands its good to be back on Majorca. Initially arriving on Tuesday, we were a little disappointed to find that it was raining. We spend the whole day on Wednesday putting the boat back together and getting out for a little sail in the pouring rain. It had rained so hard that the boat park had pretty much turned into a swimming pool. But on Thursday the weather changed. We were back to 'normal' Palma weather. Rather excitingly the film team that have been working with us had made the trip out to Palma too. They joined us in the morning and got a taste of what its like in the build up to an olympic regatta. By midday the breeze had kicked in and we were back out on the water. We had a great session joining in with some of the coach lead racing. At this stage in the build up its great for Nikki and and I to do some racing and get into the right frame of mind. Friday was an awesome day on the water the breeze was up and the sun was shining. The film team joined us on the water and I hope got some fantastic shots of us flying around the bay. It did all end rather abruptly when our mainsail lock ring gave out, and we were forced to drop the main and sail in under jib. That takes us through until today, where we plan to register for the regatta get the boat through measurement and then escape Can Pastilla for a few hours for a change of scenery. Tomorrow is the final day before racing, where we will join in with the practice race and get the boat polished and ready for battle. The regatta website is http://www.trofeoprincesasofia.org/en/default/races/race have a look for live tracking and results during racing next week. I have been away for a week now, and after a few good, long days on the water we are having a bit of a slower morning today. Just as well because as i look out of the window there doesn't seem to be a breath of wind. Nikki and I have spend the last 4 days working together and really finding our feet as a team on the boat. As we sailed in yesterday we chatted about how we felt things were, and both commented on how easy it seemed to be sailing together. While there are always improvements to come, Nikki and I are very suited on the boat I think, our skills compliment each other and when the creases are ironed out, I really believe we have huge potential. 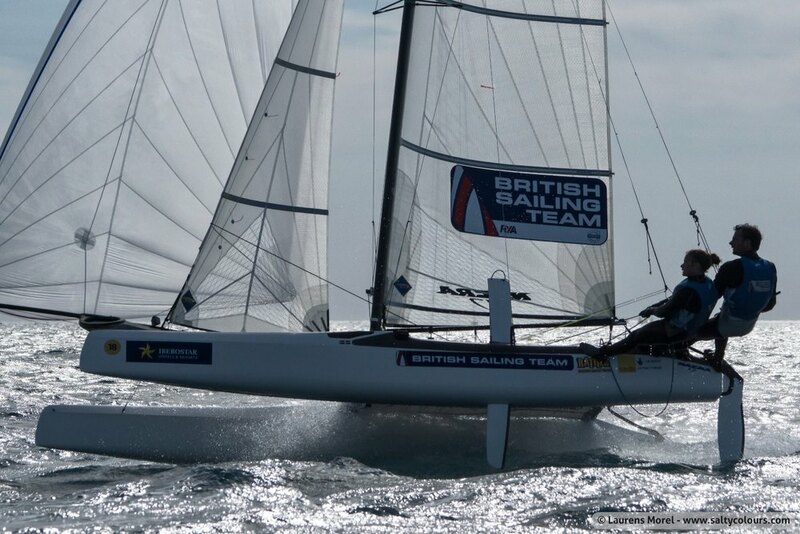 After a good first day in the Palma training regatta, we were keen to continue the consistency. In generally light winds we felt really competitive, great boat speed, and as we learnt to combine as a team our decisions around the course improved. In wacky conditions the race committee only managed 1 race on the Saturday and then 2 on the Sunday. Bar our false start we remained consistent, and in the tricky conditions that left us in 2nd place overall. A fantastic result for us a new team. Most importantly we have come away from the little regatta with a clear focus on what we want to focus on and improve on. We remain based out here until Thursday, and plan to spend as much time on the water as possible. I will try and get a few pictures, but for now this will have to suffice, got to love a hoisting face! Im must be carful what I say now, because my very theatrical sister will make me look silly if I get ahead of myself or slip up! Over the last couple of weeks I have been working closely with S2S Media, and Falmouth Universities Film Course. Led by David Morris a hugely talented group of students are collaborating to produce a short film about myself, the team and the trial and tribulations involved in an olympic campaign. As part of the project we have done a huge amount of filming, both on land and in my much more natural habitat at sea. The team have done a fantastic job so far and i really am excited to see the final product once filming has finished at the end of next month. As with any long silence, in this business it's not because nothing has been happening. In fact it's quite the opposite. Since returning from Miami a few weeks ago, things have taken a rather exciting turn. I have to say after initially being a little downbeat about the result in Miami, my motivation and excitement are now fully restored. Taking a step back and looking at the bigger picture Mary and I were probably just too late in combining as a team to launch a full assault on the 2016 games, and thus having given it our all in a truly admirable way, we have decided to call time on the partnership. Mary has been a great team mate and has taught me a lot in the last 6 months, she has just returned from racing an offshore out in the Middle East, and proving her great talent. We laughed a lot over the months sailing together and move forward happy and as good friends. Following this decision, and a few other changes within the program, An opportunity to sail with Nikki Boniface became an option. Nikki and I have a great history sailing together, in the summer before the Nacra 17 was released we raced together winning a nationals, European and World championship. A lot of which was raced against the same people in the nacra today. We have now teamed up officially and are both extremely excited and motivated about the development. We know everything can't happen at once, but intend to put the hours in, control all the detail and the results will follow. e have already managed to get some good training sessions in place and have spent time with the rya specialists putting all the foundations in place to build on as the team grows and improves. It is a bit of a case of jumping in at the deep end, we shortly leave for Palma training and Olympic regatta. The Miami container arrives home at the end of the week, we will need to quickly unload, use the weekend to get any little jobs done to the boat and then leave for Palma early the following week. Now the 'cat is out the bag' you will be happy in the knowledge that my incredibly grammar faulted blog updates will recommence. Stand by for the next chapter, it's going to be a good one. Apologies for not writing sooner, but as may have noticed from my tweets this week has been a bit of a tricky one. Having thrown so much at this regatta, it was a bit of a shame that the wind and weather was so wacky all week. I think it's fair to say all the snake and ladders didn't give us the best opportunity to shine. Having made a good start on day one. Things got really hard in the middle of the week. It's never nice to see yourself slipping the wrong direction in the results, but we woke up fresh everyday and gave it our all. The crazy nature of the race track saw a lot of ups and downs from the entire fleet. We just struggled to link the 'ups' together. One big improvement was our lighter wind competitiveness. In the past it Mary and I have found those conditions hardest. But this week arguably it was where we got our best results. On the final day of racing the wind was a lot lighter and we had some good consistent results. Alas it was a little to late, by that stage the points between boats had spread out so much that we didn't climb up the standings much eventually finishing in 20th. While on the face of it we were pretty disappointed, with only a day of hindsight I can already see some of the positives. Light wind speed has drastically improved, starting was notably better by the end of the week and our boat handling manoeuvres have taken a step forward as well. Next regatta for us is Palma OCR at the end of March, so between then and now we plan to get plenty more hours on the water training, though Mary is competing in an offshore race so we will work around that. We have been container loading today, and then have a couple of days before we fly home. Looking forward to getting back to good old Blighty for a bit of wind and rain! Thankyou to all for your support, I am as hungry for this as ever. A huge thank you to all of those who have contributed, I am now on the brink of the first Olympic regatta of the year and you have made this possible. Tomorrow the Miami Olympic class regatta begins, we have had a fairly chilled lead up over the last few days, to make sure we are fully ready and raring to go for tomorrow. There has been a lot of Polishing and tinkering, and I think fair to say Blink is looking particularly good at the minute. Having gone through registration and measurement yesterday, today we got out on the water for one final little sail. There was some racing being hosted by one of the other teams which we joined in with. It was a great little shake down before the real deal starts tomorrow, and was also a good opportunity to check in speed wise with the fleet. You will all be happy to know we seemed to be going rather well. Check back tomorrow for and update after day 1, there is a fair bit of breeze forecasted so I'm sure I will have much to say! Over the last few days we have been doing a lot of sailing, Mary and I have been competing in the the North American Mid winters. This is generally used by everyone as a warm up regatta for Miami OCR which starts next week. I would to have said we had a good range of conditions during the event, but in reality all 3 days were in pretty light and very unstable wind. Despite not being nearly as fun this was a good thing for us. Mary and I have had very little racing experience in less that 15kts so it was a great chance to learn a few things. We were racing on the furthest out race course and with no rib/coach boat for a tow, we needed to make sure we launched as early as possible everyday just be on the race course with enough time to go through our pre race checks. On the final day the wind was really light and the race course further still, we were the first to launch and it took us 1hr 20mins of flat out sailing to get to the start area. Most of the other boats without a tow were late, but in that case the committee were kind and delayed the start. As for results over the event, we basically ended up in 13th. This is a good step up from the worlds at the end of last summer, and with all the top teams here it shows some great improvement. Within the races we had a mixture of finishes, with what seemed like some very random snakes and ladders racing, everyone was up and down. We scored a number of top 5 finishes, but also some showers. Our boat speed seemed really good, and all things being equal we were always moving forward through the fleet. We have a rest day today before the build up to Miami OCR starts tomorrow. Last night we fully embraced American culture and went to watch the Miami Heat play basketball. It was an incredible experience, and genuinely gutting when we lost right at the end. Work begins again tomorrow, so check back for more updates soon. Well I am most definitely home, Cornwall is doing its best at being windy and cold, its very good at it! A complete reverse of our final few days in Miami. As we neared the end of our first block in Miami it seems the weather had decided to take a bit of a rest too. That said it was great for us to do some sailing in the lighter winds which we haven't really spent a lot of time in yet. We managed to finalise some of our set ups and now have a good idea of what final tweaks need to be made before we start racing after christmas. In and around the sessions on the water there was a little waiting for wind, while the girls were very content sitting in the sun, Rupert and I weren't so easily pleased. Fortunately a few games of throw and catch then progressing the basketball was enough to keep us going. Though there was a bit of sitting as well. Another personal highlight for me, was being able to drive up the coast slightly one evening to see a great friend of mine. Luke and I grew up together terrorising the waters and hills here in cornwall, since he has been working on super yachts i rarely get to see him. It was a great evening watching the christmas boat parade. After what felt like only days it was already time to wave goodbye to Miami, The training block has been so so valuable. Some huge hours on the water, and some big steps made in our performance. It really does feel like we are steaming in the right direction. Thankyou to everyone who contributed and made that trip possible, we are closer to Rio for it. For now its back to good old blighty for christmas. I am really looking forward to catching up with family and friends before returning to Miami in the new year for the next instalment and racing! Some things never change, if any of you still know any ways in which you can help the uphill battle continues, and i would love to hear from you. I think it fair to say I kind of like it out here. The 'winter' weather has been perfect for sailing. We havent had a day under 20 degrees, and on the whole the wind has been really nice as well. All of this has equated to some great hours on the water. Following my last blog we continued to sail for a couple of days and managed some really productive sessions on the water. After a fairly relentless introduction to Miami, we opted to take a rest day. Following alot of deliberation on what to do during our time not sailing, we eventually settled on driving down to the florida keys and seeing a little of the scenery and wildlife down there. After some seemless navigation we made it to Key Large (the first of the keys), Having pulled in to the first tourist information centre we were only in there 5 minutes and left with a booking for a jetski wildlife watching tour. It was a great trip, unfortunately the wildlife wasn't abundant, but we had a great time. I think the highlight must have been when one of the other skis on the tour managed to roll, this left 2 very surprised 'older' people floundering in the water. All very entertaining. The long drive back to Miami was made bearable by the incredible sunset which seemed to go on for hours. On Tuesday it was back to business. Miami provide some more glamorous conditions and we made the most of it. We were even joined briefly by Stevie Morrison (2 time olympian), who offered some words of wisdom from the rib. Over the subsequent few days we got some great time on the water, it really does feel like we are learning everyday and moving forward. As we arrived at the end of the week, the wind for the first time has been a little ropey. Yesterday the forecast was for nothing, so we took the opportunity to get a few jobs done. The girls took great delight in wondering a near by shopping centre during the morning. myself and rupert's experience can probably be best described as power walking around a giant building. IN the afternoon we met up with some of the other nacra teams and made fools of our selves on the South Beach volleyball courts. needless to say i think we will all stick to the sailing. A now we are up to today. fresh and ready for another training block. As i sit and write this the breeze seems to be building so we should have a good day on the water.